I grew up in a family with nine kids. (And yes, I realize this is an extremely cheesy picture...but bear with me because it illustrates my point.) I adored it. I loved being second oldest. I loved that there was always someone to hang out with. And I loved that most of the time there was a baby to hold. Although I have extraordinary parents, there's no way two people could get to the needs of nine kids. It's just not humanly possible. So, they instigated a plan. A serious plan. A plan of delegation. The older kids were assigned to be the "tutors" of the younger kids who were the "tutees." Each month we older kids would be assigned to tutor a different tutee. We'd help them with their homework, sit by them and dish them up at dinner, help them tie their shoes, help them be quiet in church, etc. Well, although Dave and I did try instigating this plan a few years ago in our family, I kind of forgot about it until one morning last week. I went in to check on the little girls at 6:45 before heading down to practice with Elle, and saw this: Now, this is actually not an unusual sight. It's actually pretty much the norm. These girls get up early each morning and talk. They figure out their outfits. They read. They get into deep discussions as they take turns going to the bathroom. It made me think about how much these kids look out for each other. Sure, they have their arguments...a lot of them. Certain kids get left out more than others. And they are dramatic beyond belief when they get in fights. BUT, they can also be SO kind to each other. I thought about how Max will be the first to jump up and get a drink for Lucy when she's begging. I thought about how Max and Elle were both just as sweet as honey over their baby sister when she got hurt at a friend's house the other day. They both just sat there on the couch cuddling her with worried looks on their faces. 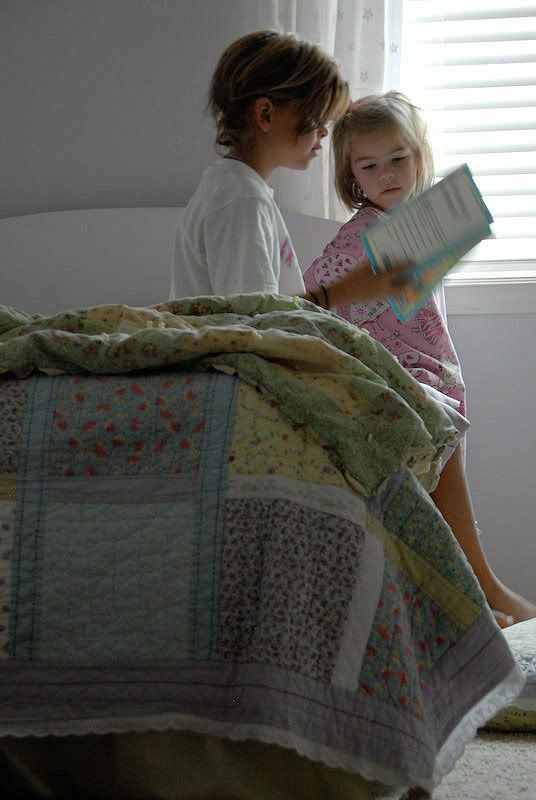 I thought about how all the older kids have "dibs" on who gets to help Lucy in the car or who gets to help tuck one of the little girls in bed. I thought about how Grace dotes on Claire and tries to help her pick out matching outfits for them to wear all the time. 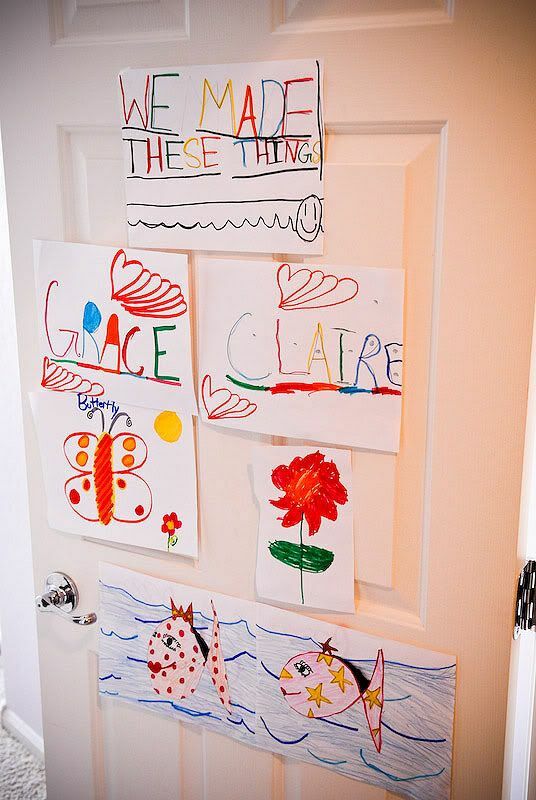 ...or how Grace will teach Claire how to do an art project she did in school that day...and they'll post them up on their bedroom door. I thought about how Elle will wait while Grace moseys around in the mornings (boy it takes that girl a long time to get going in the morning) and will let her walk or ride her bike to school with her and her friends. 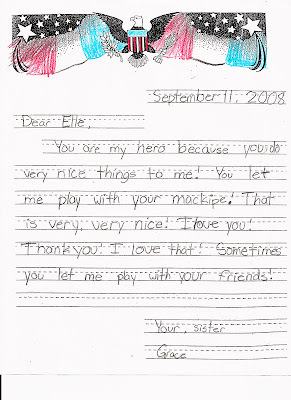 (Especially since there was a time last year when she wouldn't have anything to do with her tag-along little sister.) 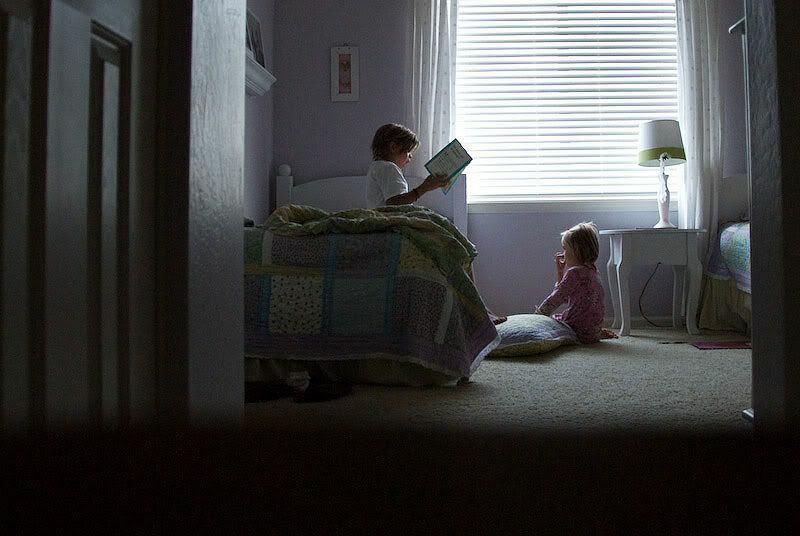 I thought about how Max and Elle will read story after story to their little sisters. What I realized when I saw these girls that morning (in the picture) is that unbeknownst to us, we have tutors and tutees. No, it's not some formal deal like I had growing up, it's just sort of happened. And even though I want to be the one who's always doing the reading and nurturing, I couldn't be happier for my backup side-kicks. I'm so thankful they have each other...and that I have them. Awwwww...I'm an only child and love seeing your posts about your "clan"! We have two and are hoping for more! And I too love the way my oldest tends to the younger one. It is the part of motherhood that brings me the most joy. 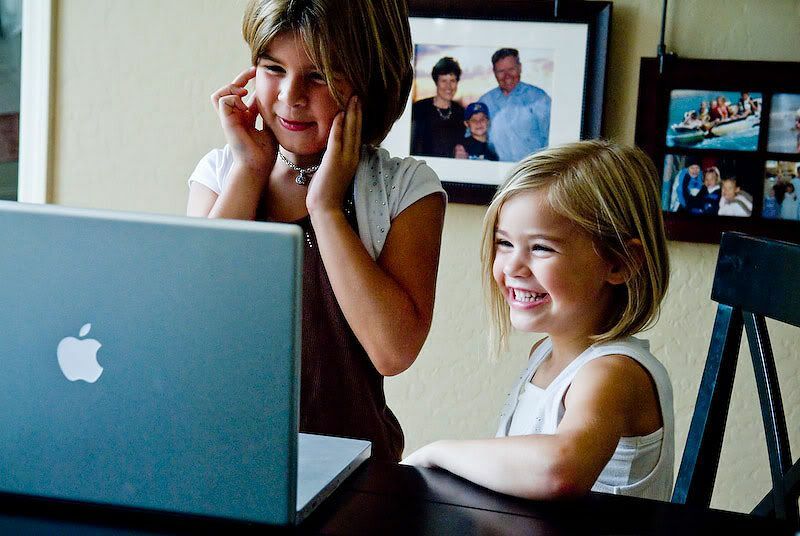 Wow, Shawni, love this blog! The pictures bring what you say to life! How I loved those old tutor, tutee days. The thought never crossed my mind that it might drift into the next generation. Time brings great things! P.S. What are you doing blogging at 6:13 a.m.? You are amazing! So sweet Shawni - I love the "tutors and tutees" idea! The picture is the cheese -- but I love it. It's on/in so many books I"ve read. :) Family unity; it will get us through the tough times. Love this post! It's nice to be reminded amongst the fighting, arguments etc...that they really do love and look out for eachother. Better yet, photos documenting this as evidence (and of course, good photos at that!). Loved the tree branch...I'm sure your brothers love that even more than you do! Big families are awesome! Interesting thoughts! Having had much of the "mothering" duties for my younger sibs as I grew up - I can say that the older kids are also benefitted by this arrangement. Now those are my best friends, even if they were born a decade after me! So so cute! I love that little note! I can't believe your mom had all those babies! I admire that. I feel overwhelmed with four! Shawni,I love reading your posts. I find the things you always have to say very inspiring. I can't wait to se this book you've been working so hard on! I know what you mean. I was always so glad to have 8 siblings to play with and now that we're adults, we each have eight great friends, too. I've always been envious of big families. I have one sister and we are like night and day. I love her to pieces but we lack that harmony your family had. I hope that my kids will remain close. I love how my girls hover over Daniel and try to take care of him. That little Claire is so cute in Sunbeams. Love the picture of your family on the tree. Love those pics of the girls....and I have always loved the one in the tree. What would we do without our tutors? I rely so much on Cole and Summer. What??? I can't believe you said the tree limb picture is cheesy. I love those little moments when you see your kids helping and serving each other. Nothing makes a mom prouder! Whenever I upload a header it spills out on the right side of the border. i've noticed others do too. How do you get yours not to spill out? I even give it a border and it still does? Any ideas? Oh I'm totally going to have Tyler tutor Luke and then I wont have to do anything! ;) Sheesh, why didn't you tell me about this sooner! j/k I love this post. You're such a great mom. Shawni! I have been going CRAZY! For days I have been trying to get on your blog and every time I do it crashes my computer. So I hijacked my husbands to catch up. Love your words, ideas, and of course, photos. Wish I had older kids to try out some tutoring! I love this post Shawni. My boys will argue as well...but I love to listen to them at night when they lay in their beds talking to each other, sometimes advising each other on what to do in school, or when the boys jump so quickly to help Ryan...sweet! Thanks for the reminder! This blog made me cry. It made me really miss you guys -- I wish I could see those sweet kids of yours that inspire you to write such heartwarming stories and take these incredibly beautiful pictures. Szilvia! I was so excited when I saw your name here! Then I tried to connect to your blog but there was nothing there. Do you ahve a blog? I'd love to catch up. We miss you guys! That is the sweetest thing! 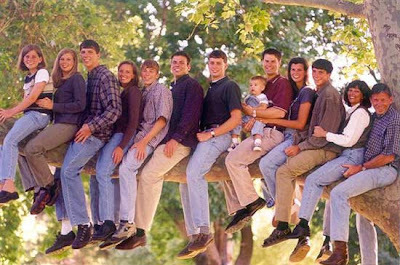 Isn't it great being raised in a big family?! I loved having my sisters as my friends growing up. What a great idea about the "tutors and tutees".